Today we learned how to use the Japanese particle で (de) to indicate the place at which an action or event takes place. We learned that it can be used like “at” or “in” is used in English. In this review, we will talk about some other uses of the particle で. 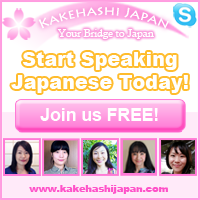 ★　The Japanese particle で (de) is used to indicate the place at which an action or event takes place. It is translated as “at,” “in,” or “on” in English. 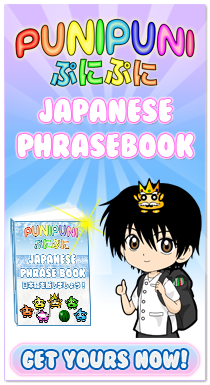 ★　The particle で comes after the place (noun) and before the action (verb) in the sentence. ★　In this example, で means at. Notice that the word order is different from English. 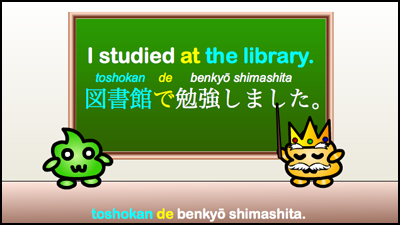 The place name goes first (library), followed by the particle で (at), followed by the verb (studied). ★　In this example, で means in. Notice that the word order is different from English. The place name goes first (pool), followed by the particle で (in), followed by the verb (swam). I swam in the pool. 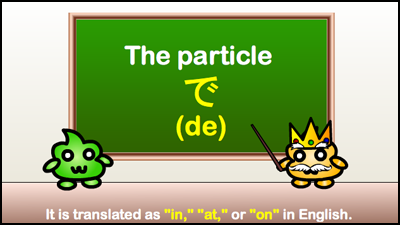 ★　The particle で can also be used to indicate means, method, or instruments. It translates into “by”, “with”, “in,” “by means of”, etc. jitensha de gakkō ni ikimasu. ★　When the particle で is placed after a quantity, time, or amount of money, it indicates a total or an extent. Zenbu de gosen en desu. 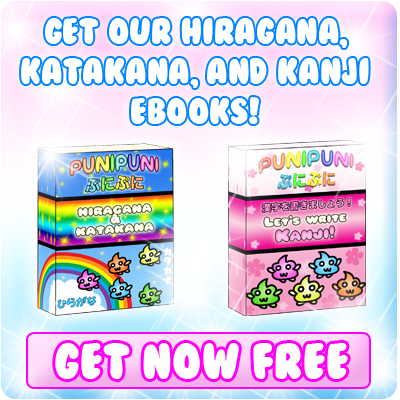 It costs 5,000 yen in total/altogether. We can get there in three hours. ★　The particle で can be used to indicate cost. It translates to “for,” “at,” etc. kono hon o gohyaku en de kaimashita. I bought this book for 500 yen. ★　The particle で can be used like “in,” “within,” or“among” to indicate scope. Sekai de ichiban suki desu. 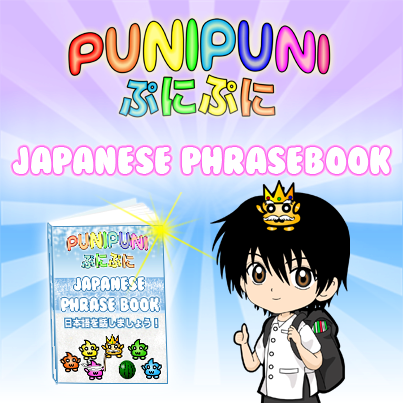 ★　The particle で can be used to tell what something is made of. Kono tsukue wa ki de dekiteimasu. ★　The particle で can indicate a casual reason or motive for an action or occurrence. It translates into “due to”, “because of”, “owing to”, etc. Kaze de gakkō o yasunda. I was absent from school due to a cold. 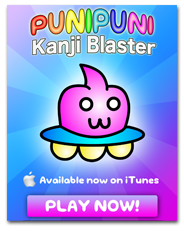 Today we learned about the Japanese particle で. There are many ways to use this particle, but you don’t have to remember them all right away. I am trying to say, “I woke up at 12:15”. It’s almost correct, but there are a few mistakes (◕ω◕)☆ You can say: 私は１２時１５分に起きました. 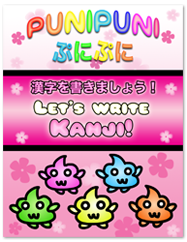 You should use time particle に instead of で in this sentence. 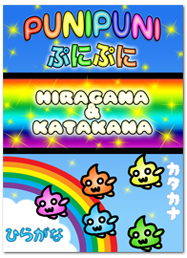 Click here to find out more about the time particle に! Also, if you want to say you “woke” up, you must use the past tense of the verb. Click here to learn more about how to change a verb into past tense! Why use “できています” instead of “できました”? Is the plain form of the verb “行ける”? What does it mean? How do I say : “We can get there in a week”. Or you know, “we arrive in a week.” Does it work with the で paricule? 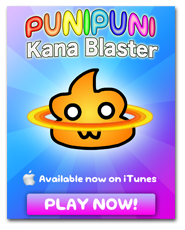 You would not use the particle で for this unless it literally takes a week to travel to wherever you are going. Hi there, when saying “I got to school by bike” it says the proper translation is “jitensha de gakko ni ikimasu” why would we use ikimasu as opposed to ikimashita which is past tense? Thanks a lot for any help, really appreciating/loving the site! Yes, 風 (kaze) means “wind.” But, 風邪 (kaze) means “a cold (illness).” The kanji is a little different although the reading is the same. Can you please tell me what the difference is between いきます and いけます? 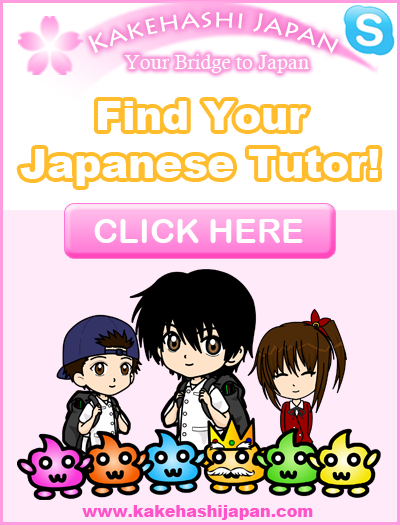 For “through” you use the particle を (o) instead of で (de).